Subthalamic nuclei (STN) and globus pallidus externus (GPe) are important nuclei for basal ganglia functions since spatio-temporal patterns of neural activity in the nuclei have a close relationship with movement disorders such as Parkinson disease. However, the mechanism of transition between normal tonic activity and pathological rhythmical burst activity with changing dopamine levels has been still unclear. Rebound burst activity of STN neurons, which is induced by strong hyperpolarization, may play a key role for such an activity mode transition. On the other hand, the GPe is a major source of hyperpolarizing input to the STN. Therefore, an understanding of the dynamical properties of a GPe network is gaining importance. 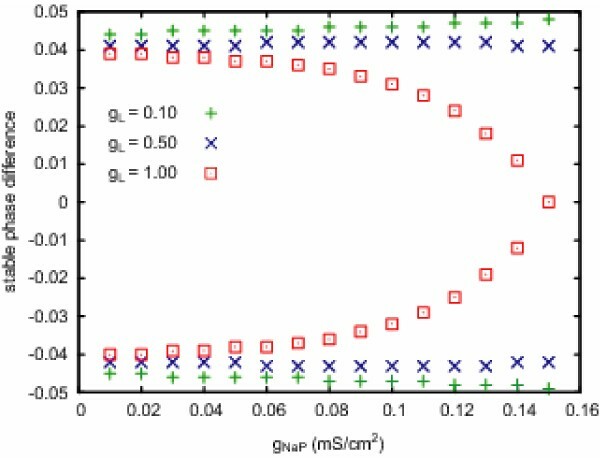 We investigated how synchronous/asynchronous properties of the GPe network were modulated by dopamine. To this end, we first constructed a single compartment model of a GPe neuron, and applied phase response analysis to the model GPe neuron , changing conductances of a persistent sodium channel and an L-type calcium channel, both of which are modulated by dopamine in the striatal spiny neurons . We examined two conditions; the condition of an identical input strength, under which the firing rate of the GPe neuron changed, and that of an identical firing rate, which was realized by adjusted input currents. Under both conditions, as both of the conductances increase (dopamine level was thought to be depleted), stable phase differences diminished, i.e., the synchronous activity came to be stable (Fig. 1). The results showed that the dopaminergic effect on intrinsic membrane property was one of the candidates to induce pathological burst activity in the STN. Stable phase differences for various combinations of gNaP and gL under the condition of an identical period. When both gNaP and gL took large values, phase difference of 0, i.e., the synchronous state, was stable.